Dr. Gary Kleck is the most important name in this research. He was an anti-gun statistician that started looking into this, found that guns did far more good than harm, built the 2.2M approximation number based on various studies and polls, and people have validated it in dozens of different ways. And he changed his views as being far more pro-gun as a result of his studies. So of course he's hated and personally attacked by gun controllers who don't want facts and statistics, but to outlaw boomsticks. His first research was back in.... but just the other day (2018) he found some data from the CDC's Behavioral Risk Factor Surveillance System (BRFSS) from 1996, 1997, and 1998 that asked "“During the last 12 months, have you confronted another person with a firearm...?” and the answers came in right in line with the 1.24-1.36% of guns households have used a gun in the last year. The napkin math version is that if you have ≈150 million households with guns, and ≈1.3% of them have used them in the last year, that's about 2 million defensive uses. What's interesting is the CDC had buried this research and had intended for no one to notice. Why is that? Ad Hominem: since people can't address Kleck's bigger points, and they can't grow or change their view based on mere facts, they often just attack Kleck. But the logic is still logic. If there are 293,066 rapes per year, 806,843 aggravated assaults (more than regular assaults), 367,832 robbies. 2,188,005 burglaries. There are 300-500M guns. Those are just REPORTED numbers -- all are low because of unreported numbers (figure by 50%). More than that -- those are actual numbers, how many more were attempted crimes that never went to fruition? 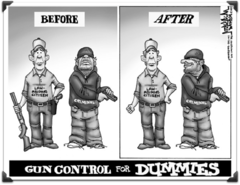 Of 4M crimes per year (probabl 8-16M attempted and/or unreported crimes), with around half of the population having guns (and many of those crimes at home)... how many felt a gun stopped them and saved their lives? Seems that the half million number up to a couple million DGU's isn't absurd at all. Morally, if you were a raped female, how many of those Women do you think should be allowed to have a gun for self defense? How about other victims of crime or violent crime? So even if there is there a slight exaggeration by DGU users, "I could have died", that doesn't change the fact that it was a DGU and the gun helped make people feel more safe. So anti-gunners can believe what they want to believe, in spite of the data to the contrary. I'll stick with the scientific studies, logic and data. It doesn't matter how you calculate it, whether you're at 100K DGU's or the 3-4M high number, either way the benefits of owning a gun, far outweigh the risks/consequences. And it shouldn't matter if it didn't. Even if 100K were saved by a gun and 100K were murdered by them, shouldn't the choice on which side of that you want to be on, be left to individuals? I might not agree with extremists views on a lot of things, but in a free society, it is their right to make choices I don't agree with. So pick your battles. Mine is let people make their own choices on whether they want a gun in their house.... they just don't get to make that choice for everyone else.